When we started Men Make a Difference Men Against Domestic Violence in 2009, one of the goals of the group was to raise awareness. I suppose we’ve been successful because the number of women and children served by Interval House has increased by 50% since that time. While it is indeed good news that people are more aware of and are seeking out Interval House’s services, it is truly unfortunate that there are so many people in need of those services. It is also unfortunate that this increase in demand for services has occurred during such a difficult funding environment for all non-profits. 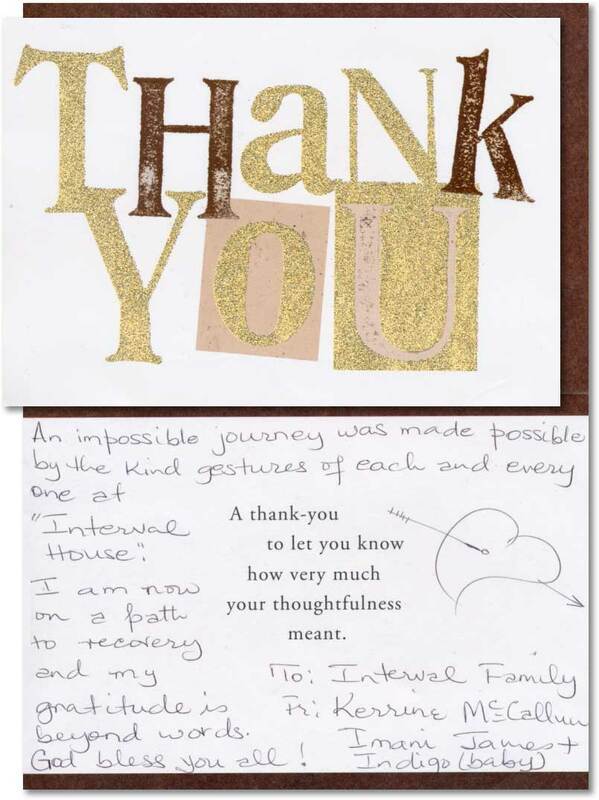 For these reasons, I’m proud to financially support the important work of Interval House. I give because I am confident that the services and resources will get to those in need. I am invested in the cause and in the agency because I know how much Interval House is needed as a reliable domestic violence prevention agency in our community. Interval House has changed and empowered lives and I am glad to be a part of that. Abuse has no social, geographic or economic boundaries. It often comes as a surprise to the abused as control is exerted and the relationship changes from “lots of attention” to full control. It could happen to any of us — and likely has or will occur in dating, marriage and other family relationships. Donating to Interval House has been a priority for us for over twenty years. It matters. As a long time board member I am proud of Interval House — its staff, its clients and its successes. We’re here to raise awareness and money for all that Interval House does. It’s sad in our society that we even need places like Interval House, but the reality is that we are fighting a huge battle in our world today, and they are helping so many. There’s something to say about handing a check over and seeing the women and children there. It’s indescribable. Personally, I feel like I’m the richest woman in the world. Giving to Interval House has an immediate direct impact on the women and children we serve in my community. I give to Interval House and am on the board because no one should have to live in fear of violence. No one should grow up thinking family violence is normal. It is organizations like Interval House that can prevent domestic violence. It is clearly important to support people that have experienced domestic violence and IH does a terrific job of doing this but the field, not just IH, needs to focus more resources on prevention which is what I am hoping future fund raising efforts will be able to support. Interval House was there for me when I was at the lowest point in my life providing education, legal advocacy, and a safe, therapeutic environment where I could share my experience with other women impacted by domestic violence. I give to ensure that others will have this same lifeline. ~ Forever grateful. By supporting the Interval House, the community education and outreach continues in order to prevent and break the cycle of domestic violence. I support the Interval House because I want to be part of the solution to break the cycle of family and intimate abuse. The Interval House has served so many women who were victims and are now living a life free of domestic violence. I give to Interval House to help continue the support that will assist in preventing and ending domestic violence in our society. As a health care provider I see the devastating impact intimate partner violence has on families. Interval House has a long history in the community providing safety, support, and other much needed advocacy services. Their dedicated staff give so much of themselves as they assist in the healing process, help break the cycle of violence while promoting healthy and safe interpersonal relationships.